Guido made his fortune as an industrialist, and he could certainly afford to keep the women he loved dripping in jewels. His first wife, Pauline, was a famous French courtesan who was better known as “La Païva.” Guido was obsessed with her, even after her death — so much so that, rumor has it, he kept her body in a large glass container of embalming fluid, weeping over her corpse each night. As one does, I suppose. Perhaps a tiara made from some of the world’s rarest emeralds was a mea culpa from Guido to his second wife, Katharina? After all, she did have to put up with a corpse-worshipping spouse. 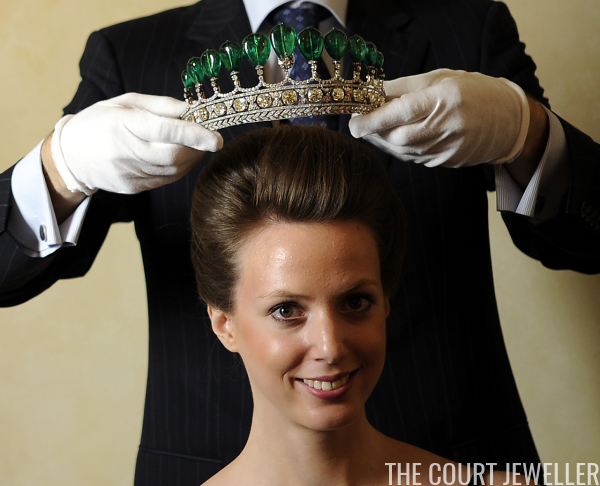 Whatever the motive behind the gift, the tiara is undoubtedly a stunner. It was made at the turn of the twentieth century, perhaps the work of Chaumet. 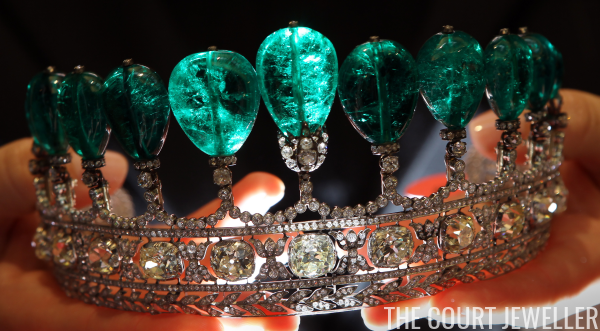 The eleven emeralds weigh more than 500 carats, and they supposedly once belonged to Empress Eugénie of France. (There are various theories about how Guido got the emeralds, but he had a history with Eugénie’s jewels — he once bought pearls from her collection for La Païva). The base of the tiara features a series of large cushion-cut diamonds resting atop a row of diamond laurels. When the family decided to sell their tiara in 1979, they turned to Sotheby’s; it was purchased that November by a private buyer. And when that owner decided to sell, it was Sotheby’s again who handled the sale. 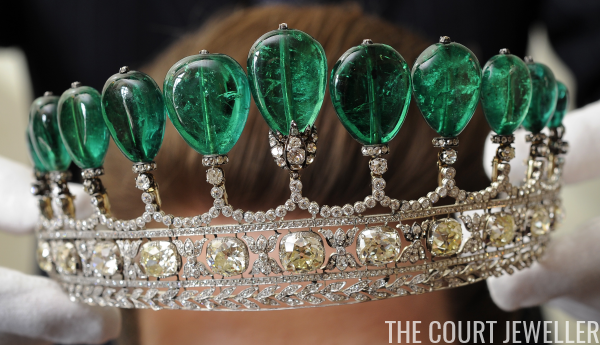 Everyone expected the tiara to fetch a bundle — the pre-auction estimates were for between five and ten million dollars. But when the gavel fell on this lot in 2011, a private buyer had splashed out a whopping $12.7 million on Katharina’s tiara. 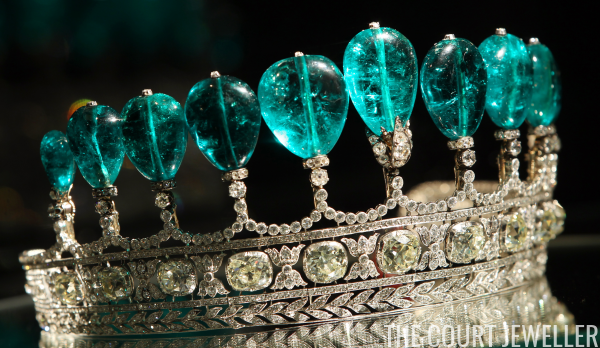 It was a world record price for a tiara sold at auction. We don’t know who purchased the piece, but it’s suspected that the buyer hails from North America. Here’s hoping he or she will want to loan the tiara to a museum some day soon so the rest of us can ogle the emeralds too! Note: This is an updated version of an earlier post, with new images.